Body Shops and US: A win/win situation! One of the most successful components of our business is working with body shops after a catastrophe type hail storm. In the event of such a storm, we can be anywhere in the U.S. Within 48 hours to asses the damage, estimate repair costs and begin scheduling repairs. We have serviced body shops in all regions of the U.S. Our expertise in hail damage repair and the body shops insurance and customer contacts make a sensational opportunity to turn tremendous profits. Insurance companies we work with: Farmers, Erie, Nationwide, American Family, Progressive and more. Many times Body Shops have conveyed to us that hail damage repair often interferes with normal day to day operations by slowing collision repair times, clogging paint booths, and overall tends to be more of a burden in the long run. So, why not turnyour hail damage repairs over to someone who specializes in it? We can help you repair more, profit more and keep your collision repairs on track. 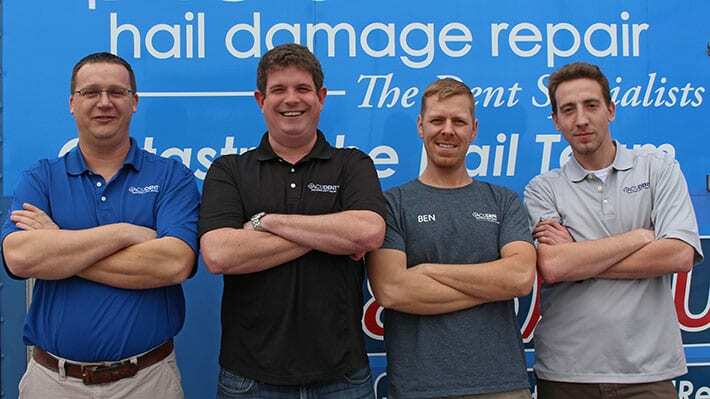 In many cases a body shop can make the same margin per hail rtepair in 1-2 days using us that it does in 7-10 days using the conventional repair method. Plus there are virtually no replacement parts or paint materials, no body shop labor or paint jobs to warranty. A win-win situation! We have proven this to be a very successful manner in which to handle a catastrophe type hail storm many times throughout the country. Acudent can help increase your bottom line through insurance referrals while handling all aspects of hail repairs. AcuDent’s highest quality repairs coupled with our unrivaled reliability mean increased revenue for you. If this sounds like an arrangement that would benefit you body shop, please contact us. Aluminum – Add 50% to regular cost. Large Roofs – Add 50% to regular cost. This information varies from year to year but is generally accurate from 1990 to present vehicle models. Note: Use a magnet to determine aluminum or metal panels.